This truly a beautiful piece that adds beauty to our home. We love it. Hearken back to warm and inviting farmhouse style with this distressed, weathered white full-length mirror. The frame is decorated in a heavy once white barn wood distressed with natural weathered by sun,water and age accents. Included is wall mount hardware to place this mirror in your bedroom, home office, or hallway. The glass is a US high quality grade and offers a true reflection without distortion. beautiful mirror. stunning in any room and great for full length needs. Was pleasantly surprised with my recent purchase. It’s a beautiful mirror and looks amazing in my all white home. Love this mirror. Its a great quality and looks beautiful in my room. White wash/wood look doesnt look "fake" pairs nicely with the rest of our subtle greys. Very lovely piece that we put in the living room. Constantly get compliments on it. The distressed look is everything. Package well, appears to be made well. I love distressed look. I was concerned this mirror wouldn’t go with my room decor but after putting it in my room I’m so glad I purchased it brightens the room up and adds a little something my room was missing! Purchased this mirror to put in our bathroom above our vanity. It is beautiful. Color is exactly as pictured. It shipped quickly and was packaged nicely to ensure no damage would be done during shipping. I was pleased with the size and how well built this mirror was made. It really opens up any room you put it in. It makes a perfect statement to any area. 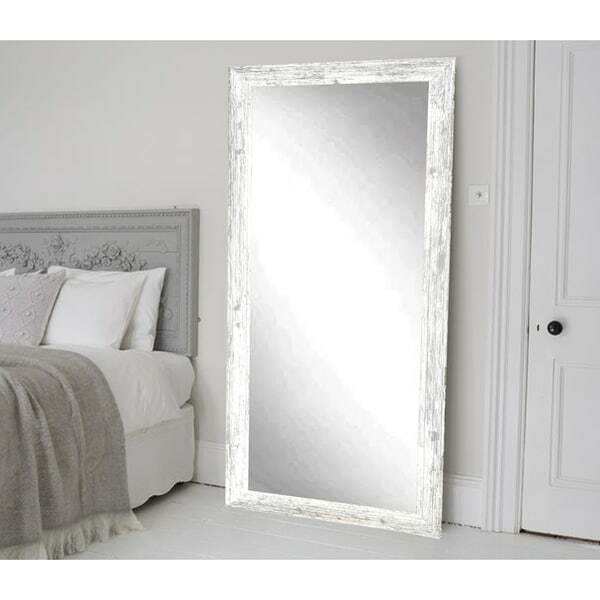 Love, love, love this mirror...as described, came beautifully packaged and adds the illusion of space in my small room!! "Can this mirror be hung on a wall?" Yes, this mirror comes with four hooks pre-installed for easy vertical or horizontal mounting. The weight is between 35 and 40 pounds. "What is the width of the frame?" The width of the frame is 3". "What is the depth of this mirror?" The depth is approximately .75 inches. 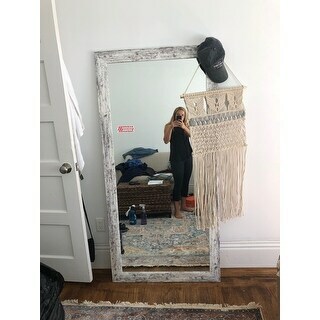 "Hi I'm interested in one of your mirrors but I'm wondering if it's a real mirror or the flimsy kind if that makes sense ? Just wanting to make sure it won't make your reflection distorted "